Who's the most admired first lady? Washington (CNN) - Bush and Clinton are tied in a new poll. But this isn't a survey of a possible 2016 presidential showdown. Instead it's a poll of the most admired first lady. 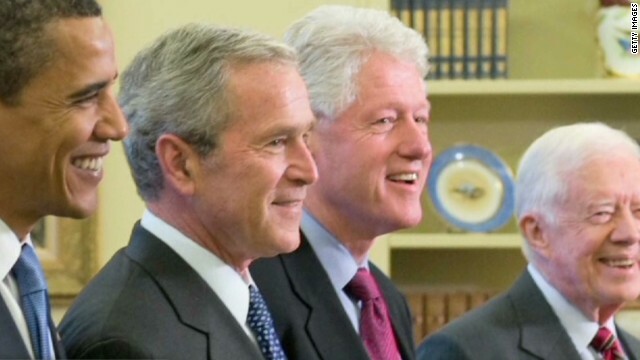 (CNN) - Former first lady Laura Bush proposed that the future first gentleman should get the same scrutiny about his looks and style as first ladies have faced in recent decades. Asked in a recent C-SPAN interview whether the media focuses too much on the first lady's hair, makeup and clothes, Bush said, "Yes. For sure." “But I don't think we can get around it. Maybe when we finally have a first gentleman," she said. The interview was taped for C-SPAN's continuing First Ladies series and airs Monday. Johannesburg, South Africa (CNN) - A powerful U.S. delegation led by President Obama and representing the current and last two American administrations, arrived in South Africa for a whirlwind visit to attend a memorial service set for Tuesday honoring the late ant-apartheid icon, Nelson Mandela. Former president George W. and Laura Bush accompanied President and Mrs. Obama on Air Force One for the 16 hour journey to Johannesburg. Also on board was a potential future president, former Secretary of State Hillary Clinton. (CNN) – The Air Force One flight from the U.S. to South Africa on Monday was historic not only for its final destination, but for its passenger list. Joining President Barack Obama and First Lady Michelle Obama for the trip to Nelson Mandela's memorial was former President George W. Bush and former First Lady Laura Bush, as well as former Secretary of State Hillary Clinton. 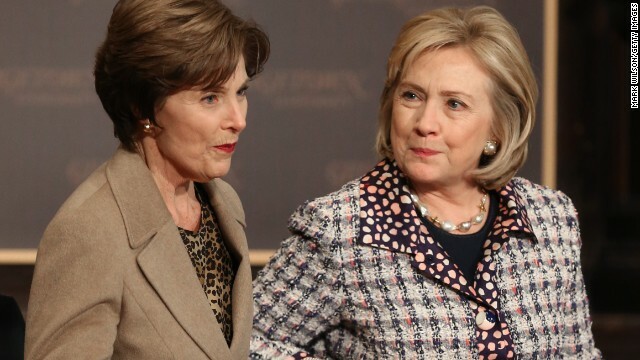 (CNN) - Former Secretary of State Hillary Clinton teamed up with fellow former First Lady Laura Bush on Friday for a public discussion about the future of security for Afghan women. "I'm so worried that once our troops leave, no one will pay attention again to Afghanistan, and we just can't take that risk," Mrs. Bush said at a Georgetown University event in Washington. (CNN) - Former first lady Laura Bush gives CNN's John King a tour of the new George W. Bush Presidential Library and Museum.